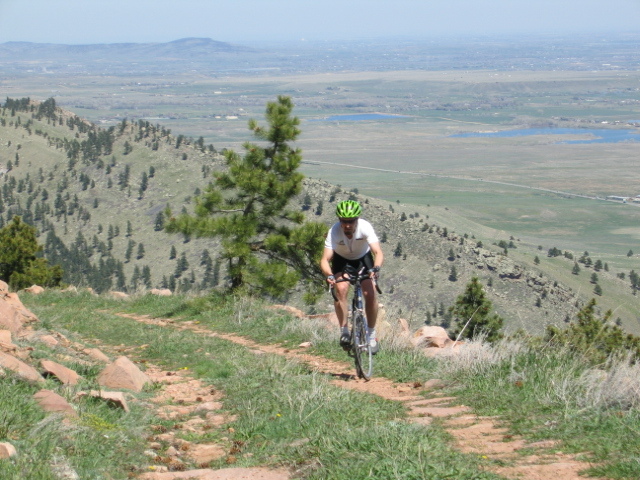 Greg rode the cobbles of Bow Mountain like the strongman he is! Like his hero, the legendary Bernard The Badger Hinault, Dave rides through any type of pain. Today, for the second time in a row, Bow Mountain has exacted revenge on the intrepid DU, leaving him bloodied but not beaten. Greg and I had to plead with Mr. U to wipe the blood off his face—the result of a bloody nose from the dry air sitting over the Front Range. Dave found a rancid pool of black water and obliged. As an aside, we need to take the squat rack out of Stauffer's office, for he's schooling me on the rollers. Either that or I need to dig out the patented Frenzy Excuse Generator, but I think Burton's squirreled it away in his cube. Check out the gallery to see Greg's suspiciously shredded quads in action. No sign of Kevin on today's sojourn, but I think I saw him at the 4:20 rally. Speaking of suspicious, looks like all that work Leipheimer put in on the Canary Islands is paying off. Why the Canary Islands, you ask? I think the Frenz need their own team preparatore, don't you? Maybe that's why Greg's meeting with Dennis this afternoon. Dennis, did you ever attend sports med school in Italy?